This article will focus on some of the laws of prayer, specifically those relating to praying with a minyan (quorum of ten men). Praying in a synagogue (with a minyan) is a segulah for long lifeAn elderly woman once came to Rabbi Yosi ben Chalafta and said, "I'm very old. My life has become unpleasant. I can't taste food or drink, and I would like to pass away." Rabbi Yossi said to her, "What mitzvah do you do every day?" 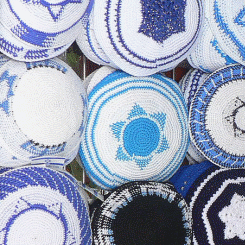 She replied, "I go early every day to the synagogue even if it means leaving an enjoyable activity." Rabbi Yosi instructed her to stop attending synagogue for three days. She did this and subsequently passed away.10 Thus, we see that praying in a synagogue (with a minyan) is a segulah (spiritually propitious act) for long life. In addition, when praying with a minyan, one is able to say and/or hear many prayers that are only recited with a minyan (i.e., Kaddish, the repetition of the Amidah [which includes Kedushah], the Torah reading, and more [see below]). Which Prayers Require a Minyan? What Happens if the Minyan Disassembles During a Prayer? If one started to say any of the above prayers with a minyan, and then some of the people left such that there is no longer a minyan present, that prayer may be completed provided that there are still six men in the room. They may not, however, start the next prayer that requires a minyan unless the minyan reassembles. Kaddish… the Kaddish may be completed. The Repetition of the Amidah… the Repetition may be completed. In fact, in this case, the Half Kaddish following the Amidah and the full Kaddish after U'va L'Tzion may also be recited, as they are considered a continuation of the Repetition of the Amidah. The blessings of the Shema of Ma'ariv… the half Kaddish before the Amidah may be recited, as this is considered the completion of those blessings. The silent Amidah of Maariv… the Kaddish after the Amidah may be recited, as this is considered a continuation of the silent Amidah. The Priestly Blessing… the Blessing may be completed. The Torah reading… the Torah reading may be completed. The Haftorah… the Haftorah may be completed. If the Ashrei of Minchah was begun with a minyan and then the minyan dissipated, the remaining men may not say the Half Kaddish which precedes the Amidah. If one started Yishtabach with a minyan and then the minyan dissipated, those remaining may not say the Half Kaddish and subsequent Barchu. If the Shir Shel Yom, Aleinu, or similar prayers were recited with a minyan and then the minyan dissipated, those remining may not say the subsequent Kaddish Yatom. If there was a minyan when the silent Amidah began, but then it dissipated before the cantor began the Repetition, the cantor may not start the Repetition. 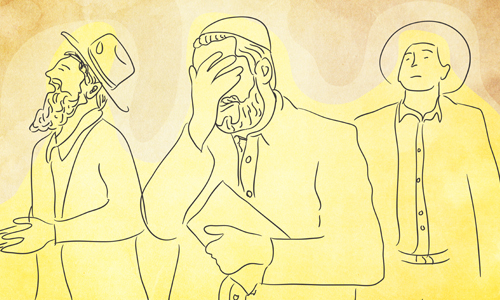 If the Minyan dissipated in the middle of the Torah reading, the Haftorah may not be chanted. Which Prayers Should Be Recited with a Minyan? The reason he didn't pray this prayer earlier is because until now, for the past 14 years, he had been studying in the yeshiva of Shem and Ever (Talmud, Megillah 17a). One who studies Torah continuously, without interruption, is exempt from prayer (Talmud, Shabbat 11a. But see Code of Jewish Law, Orach Chaim 106, that this no longer applies). Now that he was traveling, he had the time to pray (Commentary of Mahari Assad on the Torah). Code of Jewish Law, ibid., 90:9. See Shulchan Aruch Harav, Orach Chaim 98:2. Responsa Eretz Tzvi, s. 22, d.h. Derech Agav. Ma'or Vashemesh Parshat Mishpatim, d.h. Va'avadtem. K'tav Sofer on the Torah, Parshat Eikev, d.h. Ule'avdo. Yalkut Shimoni Parshat Eikev ch. 871. Ethics 3: 6. See also Tanya vol. 4, ch. 23. Shulchan Aruch Harav, ibid., 101:5. Shulchan Aruch Harav, ibid., 55:5, in the name of Rav Hai Gaon and Rabbeinu Tam. Ibid. See also Mishnha Berurah 55:24 and Sha'arei Halacha U'minhag vol. 1, pg. 138. Shulchan Aruch Harav, ibid., 55:7 and 11. Mishnah, Megillah 23b. Most of the prayers below are listed there. Shulchan Aruch Harav, ibid., 1. Code of Jewish Law, ibid., 143:1. Code of Jewish Law, Even Ha'ezer 62:4. Shulchan Aruch Harav, ibid., 192:3. Code of Jewish Law, Orach Chaim 565:5. See Mishnah Berurah ibid. 12, that one may recite them as one would read from the Torah; i.e., with the tune of one reading from the Torah. Shulchan Aruch Harav, ibid., 101:5 and Mishnah Berurah 581:14. Shulchan Aruch Harav, ibid., 55:3-4. The source for the following list is in the Shulchan Aruch Harav 55:4, Mishnah Berurah ibid., 6 – 22, and Piskei Teshuvot ibid., 8. But see Mishnah Berurah 55:10 that the cantor still recites an "abridged" Priestly Blessing. Shulchan Aruch Harav. ibid., 59:2. See ibid. Sha'arei Teshuvah 1, and Sha'arei Halacha U'minhag vol. 1, page 147. Shulchan Aruch Harav, ibid., 125:1 and Code of Jewish Law, ibid., 132:1. Why Are Ten Men Needed for a Minyan? In terms of keeping up with the prayers, the Chabad custom is not to skip any prayers in order to keep up with the congregation. Best to start the prayers with them and then pray at your own pace, even if you fall behind. That being said, there are certain prayers that are cited responsively. These should be said with the congregation. Similarly, if they are reading the Torah you should pause your own prayers to listen to that. I believe that it may be possible that the mentioned Gemorah in Taanis (note 5) is actually on daf 8a, and maybe not on 9a.